The UK has long been criticised for its close relationship with Saudi Arabia but it is time to rethink it. People hold a wheelchair recovered from under the wreckage of a house at the site of a Saudi-led air strike on an outskirt of the northwestern city of Saada, Yemen August 4, 2017. Picture by: NAIF RAHMA/Reuters/PA Images. All rights reserved. Many Yemenis increasingly see the UK’s arms sales in recent years as a vote in favour of the war in their country, – a sign of its complicity. While trade and arms deals have brought in billions in recent years, the deals are damaging the UK’s international reputation. As the Yemeni crisis deteriorates from bad to worse and the country faces the worst cholera outbreak in history, it is time for the UK to rethink its foreign policy approach with Saudi Arabia. Failure to do so runs counter to the UK’s interests and could potentially compromise its long-term security and commercial gains, as well as its ability to influence the peace process within the Middle East. The UK is able to play an important role as mediator by pushing for peace in the region and this requires a rethink of UK engagement with Saudi Arabia. 1. The UK must suspend all arms sales that have the potential to be used against civilians until a sustainable peace in Yemen is achieved. Since the beginning of the conflict, one in three Saudi airstrikes have hit civilian sites in Yemen. Over 10,000 people have been killed and at least 40,000 injured in the conflict. Besides the human toll, Saudi’s airstrikes have also resulted in the demolition of Yemen’s already limited infrastructure with the destruction of roads, bridges and factories. We need to start by banning helicopters and fighter jets, along with their guided missile systems. Despite the UK’s donation of £85 million over the past year, its humanitarian commitment to the conflict is fundamentally compromised by arms sales to Saudi Arabia. The High Court has recently rejected claims that the Government is acting unlawfully by failing to suspend the sale of UK arms to Saudi Arabia. The UK should not be contributing to the death toll in Yemen but, with this court ruling, it has come uncomfortably close to complicity, with UK military and companies implicated in the operation of Saudi’s bombing sorties. Nevertheless, every country has the right to defend itself. Restrictions should only be applied to arms that can be used to attack targets in Yemen but not to defensive arms which the Saudis need to protect themselves against Houthi cross-border attacks. Unless the UK government reviews its arms trade interests, it is damaging its international moral standing and the humanitarian principles that must be protected. But this is not just about morality. It is also about the UK’s security and commercial interests to exert every pressure to end a war that has led to Al-Qaida and ISIS thriving in ungoverned spaces. 2. The UK must call for better international surveillance at Yemeni ports. The current Saudi-led coalition has been blocking shipments of humanitarian supplies for fear of the Iranian supply of weapons to the Houthis. Saudi Arabia has accused Iran of supplying weapons to Shiite rebels in Yemen and urged the U.N. Security Council to impose sanctions on Tehran for violating an arms embargo. Ensuring that Iran does not supply weapons to the Houthis should not result in expanding a humanitarian crisis, recently described by the UN as the largest humanitarian crisis in the world. As a result of the blockade, 7 million people have been pushed to the brink of famine. The UK must exert pressure on Saudi Arabia through the UN Security Council to allow food and medical supplies to reach people in need. Satellite technology is key to increasing the effectiveness of surveillance at minimal cost. Opportunities for arms smuggling need to be shut down and vital international shipping lanes protected from disruption. 3. The UK must decisively push for an independent investigation of violations of International Humanitarian Law (IHL) in Yemen by both sides to the conflict. 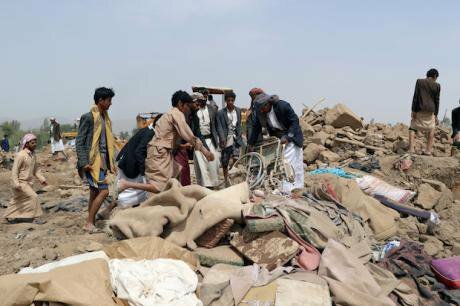 Amnesty International recently stated that all parties to the continuing armed conflict in Yemen have committed war crimes and other serious violations of international law with impunity. The Saudi Arabia-led coalition has bombed hospitals and other civilian infrastructure and carried out indiscriminate attacks, killing and injuring civilians so much so that in August 2017, Médecins Sans Frontières (MSF) said it had lost “confidence in the Coalition’s ability to avoid such fatal attacks”. Failure to hold parties to the conflict accountable to IHL only allows the current absence of accountability to continue unchallenged, compromising the UK as a peace broker in the negotiations. These proposals are ambitious but consistent with the UK’s public recognition that there is no military solution in Yemen. Peace is the only way forward and the UK needs to raise the game urgently. Past approaches have simply not worked. The scale of Yemen’s unfolding disaster and economic collapse, with all its humanitarian and security implications, call for immediate action.